YourFreeLayout.com, the future of FREE “Copy and Paste” Myspace Layouts. YourFreeLayout.com was created to fill a void in the FREE Myspace Layout market. 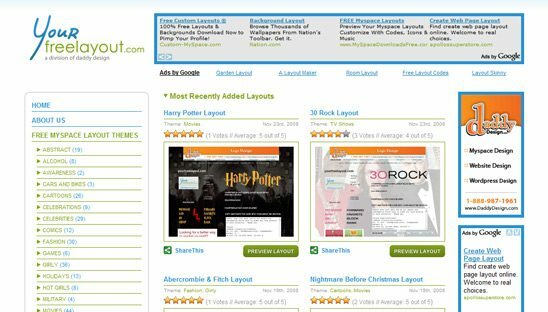 Yes we know that there are tons of FREE Myspace layout websites where users can search for FREE Myspace layouts. But none of them offer quality layouts that stand out from one site to the next, for this reason alone YourFreeLayout.com was born. We strive for QUALITY over QUANTITY, and we deliver just that, quality layouts you can be proud of. So if it’s a quality Myspace layout that you’re looking for, look no further because we have exactly what you have been searching for. This website belongs to Daddy Design. We wanted to create a better, nicer free layout site over the competition. The first step of doing this was creating it in WordPress. The capabilities and plug-ins for wordpress are amazing. We structured the layout to make it very easy to place in new layouts and advertisements.